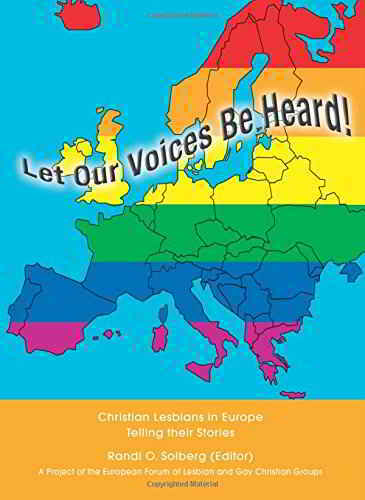 In this European anthology you will find articles, biographical stories, poems, prayers, paintings, illustrations and photos involving 95 Christian lesbians from 26 European countries. The women live in Austria, Belarus, Belgium, the Czech Republic, Denmark, Finland, France, Germany, Greece, Hungary, Italy, Latvia, Malta, Netherlands, Norway, Poland, the Republic of Moldova, Romania, Russia, Serbia and Montenegro, Slovakia, Spain, Sweden, Switzerland, the United Kingdom and Ukraine. They represent experiences from different Christian Orthodox, Roman Catholic, Anglican, Protestant, Lutheran, Reformed, Free Church, Jehovah’s Witness and Mormon church settings. The main focus is on living as lesbian and Christian! There are many books which tell the stories of lesbians or of Christians, but not many where this combination is heard. The women tell about their experiences with family, society, church, God, faith, doubt – and our own search for identity and belonging. The stories express despair, happiness, rage, gratitude, and unyielding optimism and trust. Trust in God – not necessarily in the church(es); sometimes quite the opposite. Some have left their churches and some are in the very centre of theirs, sitting in the church pews, taking part in Holy Communion. Some even stand in the pulpit and give the bread and wine. Each one of them has chosen her own way of living with faith and sexuality. One decided that she felt closer to Buddhism, while another chose a „different“ and – to many Christian socialised lesbians – unexpected road: conversion to Islam. The presentation of each of the 26 European countries starts with a country report which gives background information about the situation for lesbians (and gays) within society and churches. As an introduction to the whole you will find an article with thoughts about a lesbian feminist theology, emphasising the importance of telling and listening to biographical stories, and showing that theology is about the lives and faith of the people and their experiences with God. This is also illustrated in two sermons written and given in the Open Church Group for lesbians and gays in Norway. Titel: Let Our Voices Be Heard!